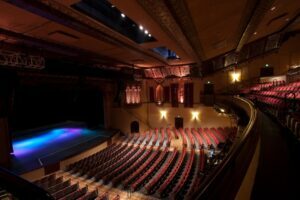 The Riverside Fox Theater, now known as the Riverside Fox Performing Arts Center, is a historic landmark in the City of Riverside, California. It holds a significant place in our region’s history, and was named after its founder, William Fox, who lost control of his movie empire in the early 1930s, but whose legacy lives on through a long list of well-known Fox entertainment companies. The Fox represents a long history of culture and community to Riverside. For decades, the Fox Riverside Theater was an integral local landmark in an area with a rich and thriving community, a booming citrus industry, and a region that carried the allure of being a luxury getaway from Los Angeles (or a lovely stop on the way to Palm Springs). Many stories mention celebrity giants of the old Hollywood era, such as Jimmy Stewart, Judy Garland, and Bing Crosby, visiting the Fox as guests! Many long‐time residents speak of initially courting their spouses at the Fox, or meeting their favorite movie stars, and others can tell what they learned about the world of cinema at the Fox. The historic theater was shuttered for many years in the late 1990s, until its revitalization period, which spanned 2004 to 2010, when the City of Riverside purchased, renovated, and subsequently reopened the venue. As a municipally-owned theater, the Fox belongs to the community! It is managed by theater operator Live Nation under the branding Riverside Live, with great economic benefits to our region from a broad spectrum of shows and big ticket events. However, shows and events are not always affordable for the public. In an effort to keep it accessible, on December 16, 2008 the City of Riverside sponsored the establishment of our independent 501(c)3 as a foundation to support our community. The Fox Riverside Theater Foundation exists to direct charitable and sponsorship funds to preserve this cultural resource and to provide quality programs for generations to come. As the philanthropic vehicle of the Fox Performing Arts Center, the Foundation independently raises all of its own funds through a team of grant giving institutions, donors, board members, and tireless program partners. 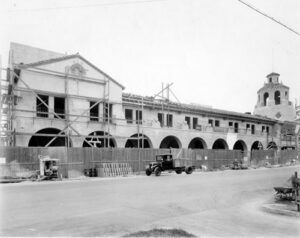 1928 West Coast Riverside Theater under construction in 1928, which later became Fox Theater. It was designed by Los Angeles-based architects Clifford Balch and engineer Floyd E. Stanberry, the team responsible for many of the 305 theaters in the “West Coast Theaters” chain, and was created in a Spanish Colonial Revival style that meshed beautifully with the 1920s’ aesthetic of the city of Riverside – but with a lavish art deco interior that was considered the height of luxury during that era, giving the venue an ornate, exotic atmosphere. 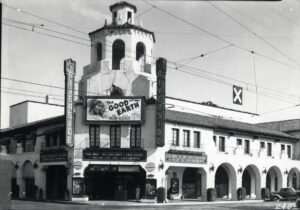 The 1,550 capacity theater was built by Abe and Mike Gore, Adolph Ramish, and Sol Lesser, who constructed these neighborhood theaters for West Coast Theaters in the Southern California area throughout the 1920s. In 1928, the West Coast Theaters group sold a controlling interest to William Fox of Fox Studios and the corporation became known as Fox West Coast Theaters, and thus the Fox Riverside Theater name was born. While this alliance with William Fox created a seamless production to distribution system for the film industry, the partnership with Fox was short-lived due to both antitrust regulations and Fox’s own financial difficulties. His corporation went into bankruptcy in the early 1930s and the theater subsequently came under control of the Skouras Brothers in 1932, becoming a part of the National Theaters chain, the largest and most successful theater chain in US history. But the name, and the brand, remained. Despite the changes in ownership, from its opening in 1929 until the 1960s, the Fox Theater was used by the Hollywood-based film industry to show previews of future film releases before final editing. Riverside was considered a useful preview site because it represented, demographically, small town America. By previewing their future releases in Riverside, the film companies believed they could register reactions to their movie within the country’s largest viewing demographic, without having to travel too far from the home office. The Riverside Theater’s opening movie, shown on June 11, 1929, was White Shadows in the South Seas, starring Monte Blue and Raquel Torres. Blue, a film star of that era, appeared in person to meet and greet those in attendance, and discuss the film. 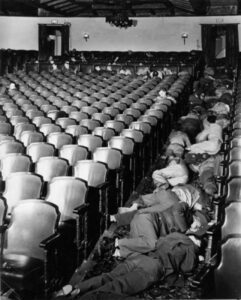 Soldiers sleep in the Fox Theater during WWII. in 1943. During World War II, the building served as a makeshift dormitory, after the soldiers from the nearby military bases filled the region’s available sleeping spaces. Manager Roy Hunt allowed the soldiers to sleep on the thick carpets of the lobby and auditorium. In 1942, the Fox Theater converted its stage and surrounding dressing rooms into a 536-person secondary theater named the “Lido,” which served as a “second-run” film house for headline pictures. Alterations and additions to the original design included the small secondary theater in the former stage house, alterations to the proscenium and various new sound absorption finishes in the auditorium. After World War II, changing demographics and fading fortunes of the surrounding neighborhood combined to decrease the viability of the Fox Theater. After a long series of owners and operators, and years of deterioration and decline, the Fox Theater was eventually shuttered for many years in the late 1990s. Its transformation to the beautiful jewel that it is today is thanks to the City of Riverside, which targeted the venue as the centerpiece of the City of Riverside’s Arts & Culture initiative, the “Riverside Renaissance” program. This $1.68 billion effort to breathe life and culture back into the landmarks and locales of the City of Riverside poured $35 million into the theater’s renovation and restoration between 2004 and 2010. During this period, the City of Riverside purchased, renovated, and subsequently reopened the venue, in order to create a performing arts facility in the downtown area for community use. This beautiful state-of-the-art performing arts center was rebranded as the Fox Performing Arts Center, with a spectacular grand reopening on January 15th, 2010, and opening nights on January 22 & 23rd, with a 1,000+ gala crowd and Grammy-award winning headliner Sheryl Crow. Today the City of Riverside continues to maintain ownership of this beautiful venue, and Live Nation provides a spectacular level of support as the manager/operator of both the Fox Performing Arts Center and an industry partner to the Fox Riverside Theater Foundation.